When the people of northern Libyan provinces felt the need of a resting and a meeting point for the pilgrims in their way to the coastal cities they came out with an idea for a place called Qaser al-H’aj (The Pilgrim’s Castle). It is located on the Tripoli-‘Aziziya-Al Jawf route in Libya about 130 km from Tripoli. It will not be wrong to call it a modern Bank Vault. This place built by Shikh A’ebdella Ben Muhammad Ben Hilal Ghanem in the 12th century. It is famous to be used for pilgrims. They were able to leave their heavy luggage prior to leaving for the holy Haj. The heavy baggage was securely deposited here like a modern day air port locker. 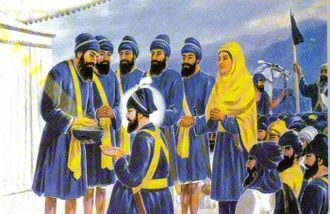 The reason was that travelers were not required to carry the heavy baggage with them. 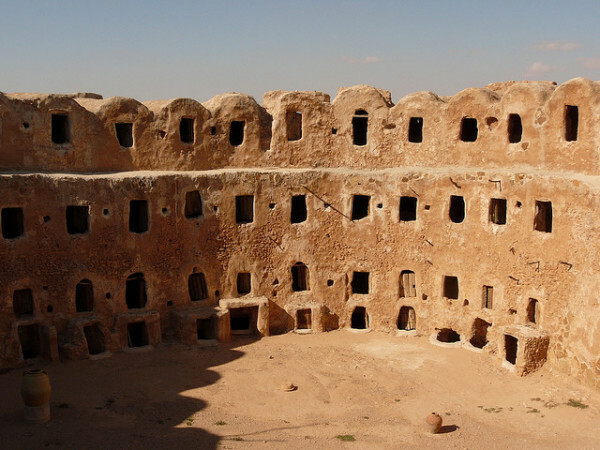 The round building depicts the finest ancient Berber architecture of the bygone times. Brick and clay were used to build this imposing massive structure. Star wars film by George Lucas shows the famous buildings of Tunisia built on this theme of clay and bricks. The building’s main door opens into the courtyard where one can see one above the other the small windows of rooms in three stories. These 114 windows are the separate lockers symbolizing 114 chapters of the Holy Koran. Every Muslim is required to visit the Holy Mecca for the Haj once in their life time. After the Haj period was over, the building was used as communal granary and olive oil center for the farmers who did not have enough storage space for their products. The farmer had the facility to use this complex by paying a nominal maintenance fee. The complex was used for the Haj pilgrims until 1960 and later on for sightseeing. These days the complex is used as a tourist attraction center. The Libyan proudly tell that it is the birth place of Banking system. They were the first to invent the modern system of bank vaults. That way here you have the genesis of the said system and the Libyans to be proud of their gift to the world.